OAKVILLE, Ont. 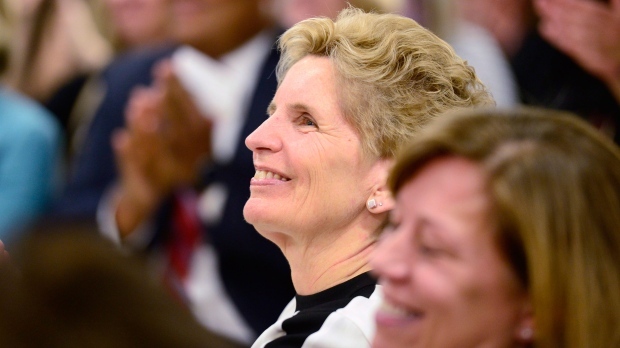 -- Doug Ford's promise to fire the CEO of Hydro One if elected this spring shows he has no plan to lead Ontario, Premier Kathleen Wynne said Friday, calling the Tory leader's pledge little more than "bluster." Wynne, whose Liberals face an uphill battle to stay in power, made her comments a day after Ford said his first act as premier would be to fire CEO Mayo Schmidt and the board of directors at Ontario's largest electricity transmission and distribution provider. 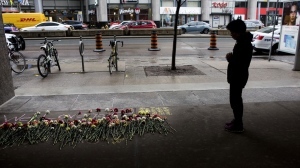 "If this is his policy approach then I think we should all be worried," Wynne said. "I think that everyone in Ontario should be worried if this kind of sloganeering and bluster, quite frankly, is what is being put forward as policy and as coherent decision-making." The newly minted Progressive Conservative leader said he would dump Schmidt because the CEO of the partially privatized utility presided over the dramatic increase of hydro rates in the province and earned a $6.2 million salary last year. "You can take this to the bank, the CEO's gone and this board is gone," Ford told a news conference in Toronto on Thursday. "When we're in government, we're going to put an end to the hydro executives getting rich off the taxpayers of this great province." 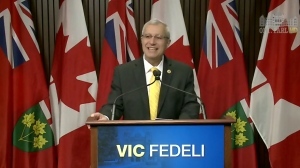 On Friday, Wynne noted that Schmidt's salary was in range with comparable positions, and said Ford's promise won't save a single ratepayer in the province "one cent." "We have a complex electricity system and saying that you're just going to remove people from office when there is really no coherent plan for how the electricity system should work, I think is irresponsible," she said. Wynne, whose Liberals have promised billions in new spending to enhance health care and child care in recent weeks, said voters don't know any of Ford's priorities yet because he has not released a platform. "We have no idea about any of his priorities apart from maybe firing one CEO," she said. "That's not policy, that's not a plan. That's a slogan masquerading as policy." Ford's spokeswoman criticized Wynne's comments on Schmidt's compensation. "It's unfortunate that the premier is defending the salaries of Hydro One millionaires while the people in Ontario suffer at the hands of their mismanagement on this file," Melissa Lantsman said in a statement Friday. While Ford would indirectly have the power to turf the Hydro One CEO, he'd have to do it by removing the entire company's board and having the new directors fire Schmidt. That move wouldn't come cheap, triggering at least $10.7 million in severance for the executive, according to the company's annual shareholders report released on March 29. The severance amount is an estimate based on the assumption Schmidt's departure occurred on Dec. 31, 2017, which means if the CEO left after that date, the figure would likely be higher. Hydro One was partially privatized in November 2015, with the province saying it planned to use the sale of shares to fund transit and infrastructure projects. By December 2017, the province had sold off 53 per cent of its stake in the company. The province's fiscal watchdog has said that taxpayers would have saved $1.8 billion if the government had taken on traditional debt to fund infrastructure projects instead of partially privatizing Hydro One, which has over $25 billion in assets and annual revenues of nearly $6 billion. The company has noted that Hydro One customers pay only two cents on their monthly bill for the CEO's compensation while nearly 80 per cent of the total executive compensation package is paid for by shareholders. 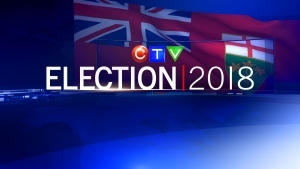 Ontario's election is set for June 7.